18:14 As the day draws to its end, calls for a sit-in in the square are becoming more vocal, according to our correspondent. Should protesters remain into the night, will the military remain absent? 17:35 A spokesperson for the April 6 Youth Movement, one of the organisers of today's protest, confirms on the stage that there will not be a sit-in this evening in Tahrir. If the protesters' demands aren't met, there will be another protest next Friday. The two main stages are being packed up. It looks like the 6pm end for the protest might hold true. 17:10 In the Northern Cairo district of Nasr City, less than a hundred people are demonstrating in support of the Supreme Council of the Armed Forces. They are demanding that the military council remains in power until a president is elected, and that the media is monitored and censored to prevent false news being circulated. More notable is their request that the curfew starts at midnight rather than 2am and that anyone who breaks it is tried by a military court. 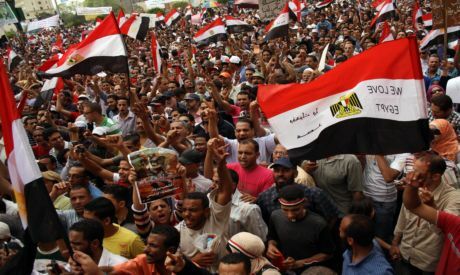 The demonstration was planned by the Stability Youth Movement, Egypt Stability Movement, The Silent Majority Movement and the Straightening the Path Movement. We haven't heard of them before either. 16:55 Fireworks and flares are illuminating the day sky above Tahrir. The day of rage has become one of celebration. 16:37 Thugs attacked the Popular Aliance stage as Ibrahim El-Eissawy, one of the party's leaders, was speaking. The attack was thwarted by Maspero Revolutionaries, a group formed to defend the rights of Copts in the wake of recent sectarian attacks in Egypt. The assailants were removed from the square. 16:15 Our correspondent in Tahrir has called in with some other chants filling the air. "Execution, execution for Mubarak," those wanting a speedy trial for the ousted president are shouting. "Down, down with the prosecutor-general," is another one reflecting either his lack of credibilty after watching on as the former regime wore the country down or impatience with the slow pace of due process now that he is actually doing his job. 16:05 With the day entering a bit of a lull, here is an interview published today with former Muslim Brotherhood parliamentarian Sobhi Saleh in which he explains why the group boycotted today’s protests. Saleh points to the lack of clarity over who called for the protests while also expressing surprise at the criticism directed at the ruling military council. The way forward from here, Salah says, "is to honour the national consensus that was reflected in the [March] referendum on the constitutional amendments." Salah, who was MP for the Raml district of Alexandria until last November's voided elections, was part of the committee which drafted the amendments approved by 77 per cent of voters by referendum. 15:50 Rami Esam, also known as the revolution's singer, is singing now on the main stage. Hundreds of protesters are singing along in unison "one, two were are the Arab armies?" Esam was arrested and allegedly tortured by the military police in March as the Army cracked down on a sit-in in Tahrir Square. 15:45 Thoughts extend beyond Egypt in Tahrir with the flags of Palestine, Syria and Yemen being waved. 15:30 It's drizzling in Tahrir now, providing protesters with some rare relief from the dusty heat in a Cairo summer day. Some fanatics had labelled anyone who attended today's protests as "infidels". 15:10 Across Egypt, people are out demonstrating on this second day of rage. In Fayoum, thousands are in El-Sakia Square in solidarity with the protesters in Tahrir. Meanwhile in Suez and Alexandria, tens of thousands are marching through the streets. Women are throwing water at those marching in Port Said Street in Alexandria. But it's ok, it's mineral water and they're thirsty. It's to the squares in Luxor and Aswan where protests are being held in Abu Haggag Square and Shuhada Square respectively. 15:10 "Where is the Brotherhood, Tahrir is here," the protesters chant. In this "second day of rage", it isn't just the incumbent authority that is being challenged. 15:05 Political analyst and rising star Amr Hamzawy, founder of the Freedom Egypt Party, used his time on the stage in Tahrir to demand the drafting of a new constitution that guarantees a civil state and the postponement of elections. 14:50 In Tahrir, one of those "suspicious elements" the military council warned of attempted to storm the National Association for Change's stage brandishing a sword. Demonstrators were able to seize him and remove him from the square. 14:35 Over in the Red Sea resort town of Sharm El-Sheikh, around 300 members of the January 25 Youth Coalition have taken the protest to ousted president Hosni Mubarak. They are demonstrating outside the International Hospital where he has been detained since 13 April. The protesters are demanding that Mubarak is transferred to Tora Prison while he awaits trial on charges ranging from killing protesters to illegally accumulating his wealth..
14:28 Our correspondent in the square reports that the crowd has swollen to around 100,000 with hundreds still pouring in over the Kasr El-Nil bridge from Giza and Dokki. 14:20 Some protesters have begun chanting against the Muslim Brotherhood in Tahrir Square. "Revolutionaries are here, where is the Brotherhood?" the crowds shout pointedly. The Brotherhood had announced earlier in the week that they will not join today’s protests, which they said will only create tension between the people and the armed forces. Since Mubarak stepped down on 11 February, the Brotherhood have lost all the goodwill they gained among protesters for their role, if belated, in the revolution. Stunts like using religion to push the "yes" vote in the constitutional referendum and distancing themselves with the ongoing protests calling for the remainder of the revolution's demands have portrayed the group as opportunists. 14:15 Prominent Egyptian blogger Sandmonkey sums up, as ever, what the day has shown so far. “I believe today has proven that we don't need the Muslim Brotherhood to turn out big crowds," he writes on Twitter from Tahrir. 14:05 The families of the martyrs of the January 25 Revolution are now in Tahrir Square. Earlier today, during the Friday sermon, Sheikh Mazhar Shaheen said that the martyrs of the revolution should be viewed with the same respect as those who were martyred during the 1973 war with Israel and their families should receive pensions. During his speech earlier in the day, Judge Zakaria Abdel Aziz told the crowd that Egypt should hire special judges to preside over cases where the suspects are accused of killing protesters. 14:00 A mass demonstration has now erupted outside the governorate’s headquarters in the delta city of Mansoura. 13:50 In Suez, which witnessed the most intense protests and bloody crackdown in the early days after 25 January, protesters have gathered in Arbeen Square. Banners in the square read: “Don’t try scaring us, we are not afraid.” The army and military police are no where to be seen, leading some shopkeepers to close their shops. 13:35 With the Supreme Council of the Armed Forces saying it won't interfere with today's protests, the intense heat was the biggest worry. So far it seems that behind a heavy sky, the sun has also not shown up. 13:32 Meanwhile up in Alexandria, tens of thousands are proteseting outside the El-Qaed Ibrahim Mosque calling for the same demands as those ringing round Tahrir Square. 13:30 On the main stage in Tahrir, prominent Judge Zakaria Abdel Aziz says there is not going to be any stability in the country unless the security choas is controlled. Karima Hefnawy, a senior member of Kefaya, asks why did the media try to scare people for the past three days from the protests in Tahrir Square. She goes on to ask who is responsible for the security vacuum in Egypt, adding that apologies from those who killed the people will not be accepted. 13:20 Away from Tahrir Square, a counter-protest has erupted in front of the famous Hussein Mosque in support of the Supreme Council of Armed Forces. 13:10 A march of a couple hundred has set off from the Mustafa Mahmoud Mosque in Mohandesin towards Tahrir Square chanting slogans that slam the slow trial of Mubarak and the symbols of the old regime. As with 28 January, Egypt's original day of rage, protesters are planning to converge on Tahrir from several meeting points after Friday paryers. Unlike that historic day, there movement is not being restricted by security forces. Without such opposition, it has been hard until now for anyone to predict how this day will unfold. 13:00 Our correspondent in the square reports that although there are lots of people, it's not yet packed. With lots of people waving flags and vendors ringing the fringes, "it's a bit of a carnival atmosphere." On one of the stages, Mohamed Abbas of the January 25 Youth Coalition is calling for the speedy trial of Mubarak and all members of the old regime. 12:55 The January 25 Youth Coalition are chanting the “people and the army are one hand,” insisting that the army is not just the Supreme Council of the Armed Forces. Yesterday, the Supreme Council of the Armed Forces announced that not only will it allow the protests to go ahead, there will be no army presence whatsoever. This came straight after they warned of "suspicious elements" threatening the safety of protesters. Two hands in one pocket. 12:00 As Friday prayers start in Tahrir, here's why a second day of rage has been called for and why not everyone is convinced by it. Banners hung all over Tahrir Square spell out those demands. One banner says: “The people demand that the duties of the National Security apparatus are laid out and that it does not work to torture or arrest people.” Another banner, hung by the Front for the Purification of the Egyptian media, has a photo of a hung Mubarak and a black list of all the editors of national papers. Another banner calls for the removal and trial of Ahmed Fadel, head of the Suez Canal Authority, while another calls for the removal of Deputy Prime Minister Yehia El-Gamal. 11:35 Protesters in Tahrir are demanding that deputy Prime Minister Yehia El-Gamal is removed from his position, that there is judicial supervision on the newly formed National Security Apparatus and that all governors, university presidents and university deans are changed. 11:30 According to Shorouk News protesters have decided to end their protest at 6pm today. 11:00 About 4,000 people have already gathered in Tahrir Square to kick off the “Second Day of Rage.” Four stages have already been set up. One of the stages is set up for the countries upcoming liberal parties including Free Egyptians Party, the Democratic Front Party, the Social Democratic Party, and Freedom Egypt. Prominent members of each party are expected to speak to the crowd today including Amr Hamzawy, Osama Ghazali Harb, Ehab El Kharat, Ziad El Elimy and Esraa Abdel Fatah. 08:30 Ahram Online's Mohamed El Hebieshy was in the square from 8 and wrote this about the mood as thousands gathered in anticipation of today. I believe the Army will protect the revolution. So much of what they have done gives me faith. This protest is to direct their thoughts. All we want is an inclusive constitution and a fair proportional voting system for all Egyptians. The Army will give us that. This is not against the Army, just a help to direct them where to go next.